Frame from video showing blast from Officer Browder’s weapon. County District Attorney Bonnie Dumanis’ absolution of a San Diego Police officer in the shooting death of 42-year-old Fridoon Rawshan Nehad turns out to have been nothing more than poorly orchestrated spin. Facing an impending court-ordered release of damning evidence, the DA released a made-for-the-media video and pleaded with the press to use her version of events. A subsequent release of information by an attorney representing Nehad’s family casts strong doubt on that ‘version’ of the story. On April 30, Fridoon Rawshan Nehad was shot by SDPD Officer Neal Browder after a 911 call reporting a man with a knife outside an adult bookstore. Nehad, we later learned, had a history of mental illness related to PTSD brought on by his time in a Afghan prison. Virtually all the original media accounts repeated the official story that he was homeless, an assertion his family denies. She said the family had to beg the police to tell them where Nehad was taken the night of the shooting and that they only learned he was unarmed after police said so in a press release. The department repeatedly told the family they were not providing them with any information because they wanted to stop any potential public demonstrations over Nehad’s death. “The one thing that they kept saying all along was, ‘Well, with everything that’s going on around the country we want to avoid a protest, we want to avoid a protest,’” Roshan said. Although Browder had failed to activate his department-issued body cam, the incident was captured by a nearby private surveillance camera. The existence of a video because public knowledge after Wesley Dolye, an employee of the business where the camera was mounted began calling local media. He believed the video contradicted the official version of events. First, Doyle called a bunch of local politicians to tell them the video was disturbing. Then he said two SDPD homicide detectives came to interview him even though police already had a copy of the footage. After that, Doyle spoke anonymously to television stations about the video because he feared repercussions. It was through Doyle’s television appearances that Nehad’s family learned that there was a video tape. They say police didn’t tell them about it. Nehad’s family promptly filed a lawsuit against the city and received the tape on the condition they not share it with anyone else. Then Doyle decided to go really public. He filed a sworn statement in court with his name attached, attesting to what he saw. Doyle’s reason: He thought what happened was wrong and thought the public should be able to see for themselves. Five local media organizations went to court seeking release of the video. In early November, the District Attorney declined to bring charges, saying the evidence clearly supported the officer’s testimony that he feared for his life. Attorneys for the city and the officer continued to argue against released of the tape after the DA’s announcement, claiming a San Diego police internal investigation and the civil case could be tainted if the video were to be released. U.S. District Court Judge William Q. Hayes disagreed with that notion on December 16th, and ordered the video released, pending a seven day-stay to allow the city and the officer decide if they wanted to appeal the decision. On December 22, two days before the stay was to expire, the District Attorney called a press conference, complete with an edited version of the video to include police dispatcher traffic. We now know DA’s version of what happened last April conveniently omitted crucial evidence, like the fact that Officer Neal Browder initially told investigators he didn’t see a weapon on the man he shot. Immediately making that statement, his attorney, who was called to the scene, ended the interview. Five days later, after further consultations with his attorney and reviewing the security video released publicly last week, testimony about Nehad holding a blue pen and flicking it around like a knife emerged. …Dumanis insisted Tuesday she was releasing all the relevant information. Thanks to Nehad’s attorney Skip Miller’s release of other material from the investigation, the public can now make up its mind about what’s relevant. “We’re not going to have a trial in the media,” said Dumanis said at the news conference, where she pretty much was doing just that. Nehad’s family, with whom Dumanis did not consult prior to announcing her press conference, said in a statement that the district attorney’s review of the evidence on Tuesday was misleading. The family, through its attorneys, disputed the distance between Browder and Nehad and specifically called out the video demonstration of a butterfly knife as irrelevant, among other criticisms. “The video makes clear that Fridoon was not an imminent threat and that the officer had options available besides killing Fridoon,” the family’s statement said. News conferences like the one Dumanis held Tuesday could become commonplace from now on in disputed police shootings. Police Chief Shelley Zimmerman has been steadfast in her refusal to release this video and police body camera footage despite initial indications the department would be transparent with police videos. In this case, Zimmerman even invoked the fear of riots in the streets in arguing to keep the footage secret. …Miller also released what he called the complete, unedited footage that shows Nehad’s death. The DA’s version has slight edits to emphasize certain aspects to the media. 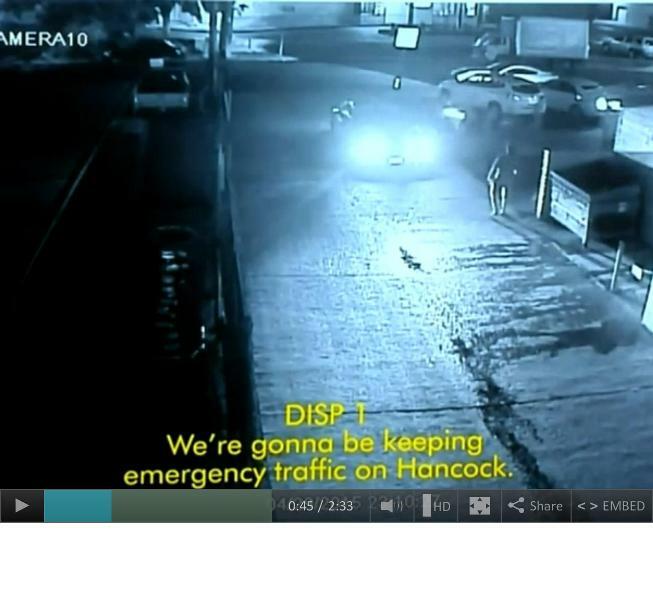 The new video begins sooner than the one released by the DA, and it shows Nehad walking in the alley before coming to the area where he was shot. Miller said he wants the public to have the unenhanced version so they can judge what happened for themselves. NBC also reported on Dumanis’ claim about a working group of local law enforcement leaders supposedly looking to formulate new policies for the public release of body camera video and other video evidence. After ACLU legal director David Loy, along with civil rights and criminal defense attorney Michael Crowley were publicly critical of the working group because its members were exclusively from law enforcement, a new version of the story emerged. When asked for a response to Crowley’s criticism of any working group that excludes community members, Dumanis spokesman Steve Walker told NBC 7 that his boss misspoke at Tuesday’s news conference. Walker said the working group has not been officially formed, has not met, and has in fact not done any work on new guidelines for release of officer body-camera video and other crime scene videos. He said no decisions have been made about the make-up of that group. The FBI is reviewing the fatal shooting. The US Attorney reportedly has a “good working relationship’ with DA Dumanis, so it’s unlikely any investigation will end up in the round file. That’s just the way things are in San Diego. The family’s lawsuit asks for $20 million in damages. An excerpt from Doug Porter’s column at SDFP. Did the cop have a taser on him or some other non-lethal means of subduing Fridoon? If approaching the car unarmed justifies being shot, what about the other guy on the top right of the screen, he was “advancing” on the cop and much closer than Fridoon. Why are some cops so scared that they have a hair trigger? Why doesn’t SDPD filter out these guys that can’t use think rationally under pressure? If any of us shot the guy under the same circumstances, would we be locked up right now? And we want “Police” cameras all over the beach in OB? Who for?